Do you remember this one? A great 1959 courtroom adult drama set in the Upper Peninsula of Michigan (yes, it is called that and yes, the Great Lakes are amazing). 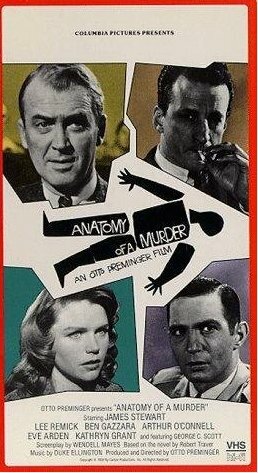 Anatomy of a Murder was filmed in the quaint little port-side town/city of Marquette, which (would you believe) is the largest city in the Upper Peninsula. Population 21,300 - no, I am not kidding. A few years back, my "extra special friend" (yes, he is..."the one") Richard introduced me to this extra remote part of the US. Having lived in cities all my life, it was a totally new experience for me. Every year, when we go back and visit, my mind comes back cleared because it is filled with this restorative calmness that you can only get when you really "get away from it all". I often wish I could order it "To Go". I took an $AUDUSD counter-trend today and it went better than expected so I thought that a dissection was in order...so that I could lay out it's anatomy in full black and white. And some quotes from the movie seemed to fit right in. Your Honor, I don't think I can dignify this - -creature - - with any more questions. Earlier last week, I had a couple of pretty haphazard trading days doing counter-trend trading which is my preferred M.O. So before I took this trade, I really needed a good interrogation of the charts before I pulled the trigger. Bossilator was way over-extended at 828 and anything over 800 is a good target for counter-trend. There was an interesting trend-line break which just happened which might be a good entry point. But the Stox was floundering in the middle and not at overbought so I really wanted to wait. Yes, I did change the template to look at the double Bollinger Bands on 1M chart. I am also trying to see if better entries on the 1M chart will produce less of a roller-coaster ride during the trade. At this point I am basically just sitting pretty waiting for the indicators to ripen. I go get some coffee and come back to see that I may have missed a nice entry at the 1M chart. So I sit on my hands and bit my nails some more so that I don't get trigger happy. Just as well, price goes down to a low of the day of 1.0293 and quickly retraces nearly 30 pips close to a support at 1.0323. And it starts to fall back down again. All right, the cat's out of the bag; it's fair game for me to chase it! Curtain calls, it is nearly time: I find that I like having the price below the SMA200 when I enter. It takes a couple of 1M candles and they finally close below both the SMA800 and 200. Also the slow Stox look good. I am in for the chase. We're in for a $AUDUSD SELL. Look at Point (1) on the chart: Enter at 1.0314, SL 25pips, TP 50pips. SMA800 was about 120pips away. My plan was to Break-Even at 15pips and just get out if I hit 30pips. Look at point (2) on the chart, $AUDUSD stalls for nearly 1 hour and I am starting to lose patience here. Finally at (3) - it moves and these huge 4 to 6 pip candles start to appear. If you look just before that you will see the indecision in the market, 4 pip white candle, followed by 4pip black candle. Point (4) - Break-Even at 1.0299!!! Yaaay! If you do that one more time, I'll punch you all the way out into the middle of Lake Superior! Point (5) - Yikes! A slight pull-back. I'm getting antsy. I remember the quote above. I have been to Lake Superior (thanks Richard), it's really, really large and I really really don't want to land in the middle! So I sit still and try not to play around too much with the charts and my mouse. If this refrigerator gets any more fish in it, it will swim upstream and spawn all by itself. Better not be greedy, I exit at Point (6) 1.0289, just after the first white candle shows itself. I am done for the day. +25pips means I don't have to take another trade for the rest of the day. It has been a great morning.